While Intel and AMD were outdoing each other at CES 2019 by announcing their respective 10nm and 7nm processors, both companies also introduced hybrid processors that may have an even greater effect of change the future of computing forever. On one side, there’s Intel’s LakeField processors, whose architecture is closer to that of ARM CPU than a traditional computer chip. Instead of just having a block of 10nm CPU cores, the LakeField processor will feature one central 10nm Sunny Cove core paired with four Treemont Atom cores. Later into the CES 2019, AMD also introduced its own hybrid processor with its Ryzen 3rd Generation chip that paired an eight-core 7nm chiplet with a second 14nm chiplet to manage memory controllers and PCIe lanes. Both processors aim to do different things with they’re hybrid architectures, but they share one thing in common: they’re both moving away from the traditional monolithic processor. Now after all that talk you might be wondering what the difference is between monolithic and hybrid processor designs? The answer is actually simpler than you might think. For the most part, processors that have come in laptops and PC have stuck to a monolithic design, in which the there’s one homogeneous processor die built from a single architecture. For example, Intel Coffee Lake processors used a single 14nm die, Ryzen CPUs featured 14nm die, Ryzen 2nd Generation a 12nm die, and so on . Hybrid designs shake things up by introducing chiplets that may add a second type of processor cores, integrated graphics, memory or any number of things. ARM-based CPUs found in phones, tablets and even Qualcomm-powered Windows 10 machines typically use this type of design to great effect for maximizing battery life and even performance. Now it seems we’re starting to see the beginnings of hybridization in computer processors now – at least in Intel’s case with LakeField. Hybrid processors could allow your devices to both handle all your tasks on demand and save your battery life when they’re just on standby by packing in both performance cores and low energy cores into the same chip. What’s more, chips with this type of architecture can act as compact systems on a chip if they also have integrated graphics, memory and other modules. Intel has actually already shown an examples of the how small its hybrid processor-powered device can be. At its CES 2019 keynote stage, the company introduced its LakeField processor built into the smallest motherboard it has produced measuring just length of five American quarters, a form-factor that could easily fit into tablets and even some phones. According to Intel, LakeField processors can power anything from very low power devices and scale up to full PC performance. 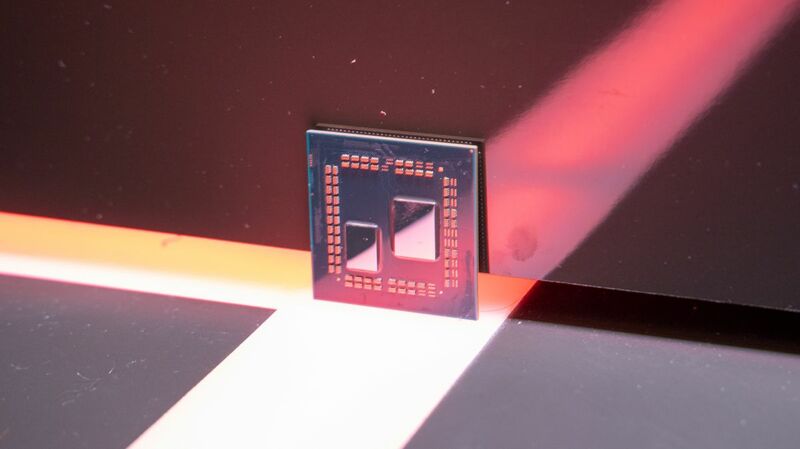 AMD didn’t nearly have any as many proof of concept examples, but it did show that it’s new hybridized processor doesn’t lose a step in performance due to the new design. The company’s mystery Ryzen 3rd Generation processor scored 2,023 points in Cinebench. By comparison, the Intel Core i9-9900K and AMD Ryzen 7 2700X scored 1,873 and 1,798 points, respectively in our own testing. While it seems like hybrid processors have a promising future in computing devices, we don’t want to buy into the hype too much until we actually get some devices with them. Also, not all devices may benefit from a hybrid architecture. For example, PCs built for production and gaming will be better off with classically constructed CPUs and the maximum power a monolithic processor can deliver – though, the regularity at which Apple’s iPads equipped with its self-made processors outpace Windows 10 laptops may prove this to be false. It’s too early to tell what devices powered by Intel and AMD’s hybrid processors may look like, but we’re excited this is even happening. The software and experience of using laptops and PCs has evolved to in step with phones and mobile devices – with touch screens, biometrics and features like modern standby – and it feels like it’s about time for the same thing to happen to the hardware that powers them.